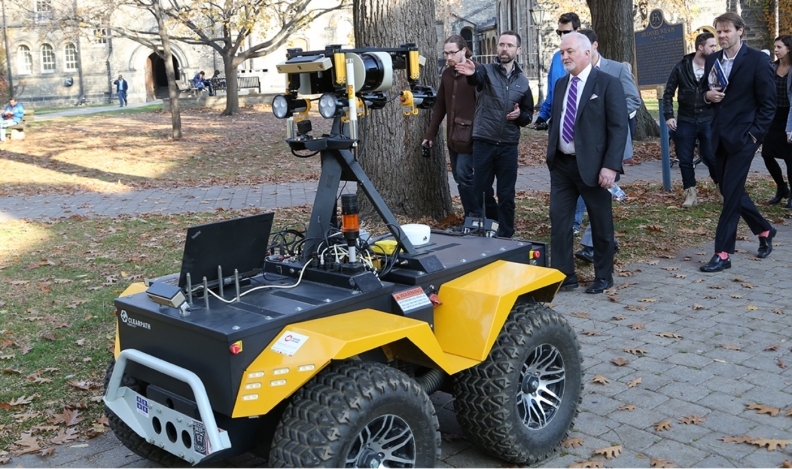 GM Canada President Steve Carlisle, himself an engineer, learns about autonomous systems from engineers at the University of Toronto. Canada has a long history in branch-plant assembly of other countries’ cars. What has largely been missing is original-vehicle engineering and research and development done in Canada by Canadians. But that’s changing in a hurry. General Motors is growing its product-engineering head count in Canada to 1,000 from about 350. Ford is investing $500 million in research and development, including 300 engineers based in Canada, many at a planned research-and-engineering centre in Ottawa. Meanwhile, FCA’s Automotive Research and Development Centre (a collaboration with the University of Windsor in Ontario) last year celebrated its 20th anniversary with an injection of funding from the province. Another study, by Engineers Canada, reported engineering-school enrollment had grown to 81,000 undergraduates in 2015, an increase of 32 per cent from 2010. Trescases cautions that, globally, automakers opening huge new engineering clusters shouldn’t take it for granted that hundreds or even thousands of engineers will be available on demand. “In fact this takes a longterm coordinated approach between industry, government and post-secondary institutions,” he said. For now, cutting-edge work at Canada’s universities is in large part why automakers are growing their engineering presence in Canada: “There are so many different fields of engineering, and some of the new programs are of particular interest to auto companies,” said Hack. “One I would mention is Mechatronics; there’s a huge demand for that.” Mechatronics is a discipline that blends mechanical engineering with electronics, computer engineering, and more. So, while GM plans to spend $10 million on its long-established cold-weather testing facility in Kapuskasing, Ont., and Ford will expand work on powertrain technologies and alternative fuels at its Windsor Powertrain Engineering Research and Development Centre (PERDC), those are minor asides to the main new narrative of automotive engineering in Canada. GM’s and Ford’s Canadian activities will focus on “new age” technologies such as infotainment, connected vehicles, active safety and autonomous drive systems. Historically, GM has been the leader in Canada-based engineering. Its Canadian Regional Engineering Centre (CREC) in Oshawa was formed in 2001 to conduct vehicle development and validation; one of its first projects was the original 2005 Chevrolet Equinox. In 2007 its mandate changed to focus on applied research and development and advanced-technology innovation. Now, not only is the Oshawa engineering facility at capacity with 350 employees, GM Canada has opened a Markham (Ont.) Campus to accommodate the expansion to 1,000 in total. Markham will focus on infotainment while Oshawa will continue with active safety and controls. The Waterloo Centre for Automotive Research (WatCAR) claims to be the country’s largest automotive-academic enterprise, with 125 researchers working on active safety, automated driving and more. In Ottawa recently, Blackberry’s QNX subsidiary opened its Autonomous Vehicle Innovation Centre (AVIC). Between the likes of QNX, Google, Apple and Uber, there’s a complex web of tech firms either collaborating with or competing against the automakers in the new world of connected and automated vehicles. And those companies also compete for engineering talent. Meanwhile, Canada’s traditional automotive speciality — the actual manufacture and assembly of cars and their parts — isn’t being sidelined. “Anything in advanced manufacturing is growing,” says Vincent Guglielmo for the Automotive Parts Manufacturers’ Association.